1. How did you end up working in wellbeing? I trained as a dancer up until the age of 21 and struggled with finding the balance between performance and aesthetics – this fuelled my interested in nutrition and sports science. I also knew that I wanted to combine my love of movement and physicality with my intrigue for science and debunking all of the rubbish that’s out there around health. 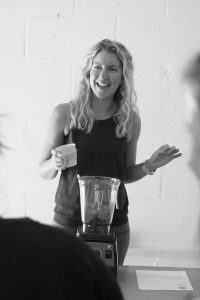 When I moved to the south of France when I was turning 30 I had a realisation that health isn’t about working out at the gym every day and drinking green smoothies. It’s about finding your freedom and your balance – physically AND mentally. I want to help people find what that means for them rather than offering a standard diet or exercise plan. 2. What’s your typical breakfast? Some days as I teach so early I’ll end up having two breakfasts and then lunch at around 11am! Usually breakfast will involve eggs in some form – boiled, scrambled, in an omelette..they fill me up much more than a sweet breakfast and are the cheapest most convenient form of protein for me. 3. What does your weekly exercise look like? Despite being a Pilates teacher I’ve always loved yoga and try to fit in a class or two of dynamic yoga a week. I’ll then try to do one higher intensity cardio workout a week for example at Project Fit, Frame or 1 Rebel and I cycle between clients so that keeps me pretty active day to day. I’ve also recently started boxing at Punch Club which is a great way to get rid of any pent up frustration! Although I’m a born and bred Londoner I find the city quite a stressful, hectic place so I make sure that I spend time by the water as much as possible – whether it’s teaching SUP Pilates at the Docklands or popping down to the sea in Kent. I find just being by the water keeps me calm and relaxed. Sleep – it’s the most underrated area of health in my opinion. If you’re deciding whether to get up at 6am and go to the gym or catch up on missing sleep I’d always recommend going for the sleep. Laugh – spend time with people who make you laugh on a daily basis. Work out what you really love and do more of it – for me it’s being outside in the sunshine and hanging out with my friends and family. Life is too short to spend it it wishing you were somewhere else or with someone else. Really good fritto misto with ail oil and a glass of Provence rosé (ok, a bottle). Watching TV in the bath or lying on a paddle board in the middle of the sea. I once worked in a weight loss centre in Chelsea and one of the diet plans recommended eating baby rusks at each meal. I quickly scrapped that one! There’s no food that’s going to kill you if you eat it once (unless it gives you food poisoning) but I think everyone would benefit from eating less sugar – and that means the stuff hidden in sugary drinks, cereal bars, sauces, alcohol and canned foods. Just one?! Ok, if I have to choose one thing (technically a food group) I’d say vegetables. Ideally we should follow the Aussies and spread the 2 and 5 message (2 portions of fruit and 5 portions of veggies a day). Vegetables will help to fill you up, are packed with fibre (great for lowering cholesterol and looking after heart and gut health) and are also full of essential vitamins and minerals.